With starting of new sessions in college many of you would be still filing college applications. College brings change in each one of us, our friends change and we find new things of our interest, our personality takes an 180-degree of change, so why not change our wardrobe?? Starting with new college life we all love to wear new clothes in college. We all want something which would be cool, trendy yet casual and comfortable. Having many options to choose it gets difficult what should we choose. We want to dress up but not overdo and remain perfect, some of you may ask the question why? Why is it necessary to get dressed and change it, I can go to college in my PJ’s and they are extremely comfortable. Yes, you can, you can wear your PJ’s to college but it’s not something you would want to wear to college. Wearing it on a day or two is fine but not making it a habit. Don’t you want your teachers to take you seriously?? No matter how intelligent you are, it’s difficult to take you seriously if you are wearing sweats, So that’s why you need to dress up to make yourself presentable. THE WAY YOU DRESS IS THE WAY YOU FEEL. 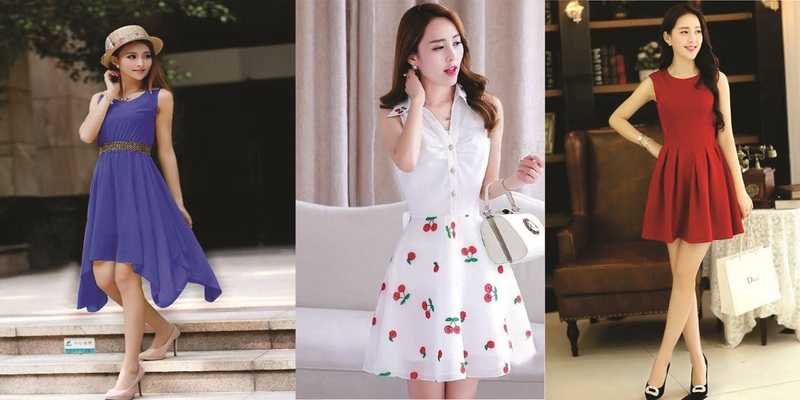 With summers going on having a lot of options, Ranging from short frilly skirts, denim shorts, summer dresses to long flowy skirts and jeans. No matter how much ease your jeans bring your skirt is an outfit which makes you looks feminine. They bring out your girly side more. They can be paired up with either your favorite chucks for a casual look or with your heels for a formal occasion. A dress that goes with every footwear you own would be a summer dress in this hot weather. Jeans go with everything too but in this hot weather, summer dress would be a more comfortable choice. They can be teamed up with denim jacket and sneakers for a casual look or with your flip flops. Wear any footwear ranging from high boots to high heels to flip flops to sneakers; they’ll all compliment the dress. And if you don’t want to wear a skirt or a dress your savior your favorite jeans are there to save you. Jeans being the always go to solution when you can’t decide what to wear. Be it a baggy jean with a tank top or a v-neck with sneakers or skinny jeans with a loose tee or open fennel shirts with a tank top underneath with heels or sneakers, jeans are the IT. They are always cool and comfortable to wear. Hope now you have some ideas. Getting dressed for college can be as easy as making a midnight noodles. Have fun getting dressed up and deciding what to wear. This entry was posted in shopping, Uncategorized and tagged best women Cotton Suit india, college Trendes, E-commerce, Fashion Designer, internet shopping, Summer Collection, Trendy with Indzola, Women's Footwear. Bookmark the permalink.